Ali Ahmad Said (Adonis) - Who is Ali Ahmad Said (Adonis)? Adonis is widely acknowledged to be one of the most important poets in the Arabic language. He was a leader of the modernist movement in Arabic poetry in the mid-20th Century. Who is Ali Ahmad Said (Adonis)? Born to a ‘Alawite family in the village of Qassabin in northern Syria, Adonis studied first at the lycée in Tartus, the in Latakia, then earned his degree from the University of Damascus in 1954. He served in the Syrian military from 1954 to 1956. He then moved to Lebanon where he earned a doctorate for The Static and Dynamic in Arabic Culture from the University of St. Joseph. From 1956- 1986 he lived in Beirut, the moved to Paris. In 1957, Adonis founded the avant-garde poetry review Shi'r with Yusuf al Khal, and in 1968 he founded a new journal, Mawaqif, dedicated to culture and literature. Among his early volumes of poetry are Qasa'id ula (First Poems) 1956, Awraq fil Rih (Leaves in the Wind) 1958, Aghani Mihyar ad-Dimashqi (Songs of Mihyar of Damascus) 1961. All his poems until the early 1970s were published in two volumes in Beirut, many of his poems have been translated into English. Among his 20 other books are: Introduction to Arabic Poetry, Symbolism in Poetry, Sufism and Surrealism. 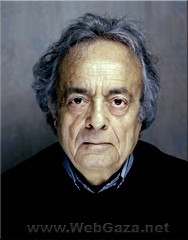 Adonis was considered for the Nobel Prize in Literature in 2005 and 2006, but the awards went to other writers.